The way a pregnant Irish Traveller was arrested was shameful and inappropriate, a race charity has said. Minnie Moloney, 25, who has severe mental health issues, was visited by several male police officers on 7 December 2017 after a row at a shop six weeks earlier. During the arrest, Ms Moloney became hysterical and was handcuffed wearing nothing but an untied dressing gown. South Wales Police said its actions were "proportionate and necessary". 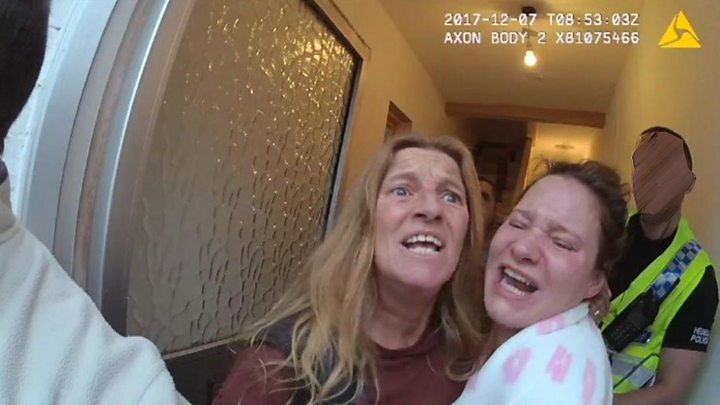 In bodycam footage from one of the officers, she can be seen coming down the stairs wearing just her dressing gown. After realising there was no woman officer, Ms Moloney became hysterical and tried to contact her mother as officers told her to calm down. She is eventually handcuffed with her arms around her back and led out to the police van despite her protestations that her modesty was being compromised by her dressing gown becoming undone. Race Equality First said the arrest should have been handled differently due to Ms Moloney's mental health issues and her cultural background which means her husband is the only man who should touch her. The force said an investigation found no evidence Ms Moloney was mistreated during her arrest for a public order offence. She was later released without charge. Police were not called to the original row at the shop, but went to Ms Moloney's home in Rumney several weeks later to arrest her. Ms Moloney has mental health issues including psychosis, psychotic mood disorder and anxiety disorder. She said the experience was "humiliating" and made her feel "helpless, stressed and worried". "When they took me out of the house, I was naked, I was stressed, I didn't have my medication, I didn't wake up properly, I knew they'd just leave me in the cell," she said. South Wales Police and the Independent Office of Police Conduct investigated and found no case to answer, with no evidence Ms Moloney was mistreated. Image caption Aliya Mohammed said the bodycam footage looked like "a bit of fun and laughs and a bit of games basically at the expense of a vulnerable young woman"
But Aliya Mohammed, chief executive of Race Equality First, disagreed and said it was racial discrimination. "I've never seen [a case] that has been caught on body-cam footage that shows such shocking scenes of blatant inappropriate, shameful behaviour. "Why haven't we had a case like this for a non-ethnic minority person? For someone who is not a Gypsy or Traveller?" In an investigation by the Professional Standards Department, the officer who arrested Minnie said he feared the situation would quickly escalate. His statement said: "I took hold of Minnie's arm and she immediately became extremely irate and aggressive to a level that I have rarely seen in my 10.5 years of front line policing." But Ms Mohammed disagrees: "There are points where she holds up her hands, there are points when she is protesting, she does swear a lot throughout the video, however, she doesn't lash out at them, she doesn't hit them, she doesn't obstruct them either, she is just protesting at the way she's being treated. "She wasn't being overly aggressive - certainly not for a woman who was half naked - with an open dressing gown and not even being allowed to cover herself up. I think it's extremely shocking." Ms Mohammed has now called for a new investigation. "In the video footage, you can see that police officers are staring at her naked body, they are laughing and they are making inappropriate comments. "Why were they doing that? Why did the police feel that it was appropriate and that they were able to actually make such inappropriate comments?" South Wales Police said the incident highlighted the "incredibly difficult job" officers do on a daily basis. "Once a complaint was received it was immediately referred to the Independent Office for Police Conduct which directed a local investigation by the force's professional standards department," it said. "An investigation found that none of the officers had a case to answer and the complainant was sent a report containing the findings of the investigation." The force said it had met Race Equality First, no new complaints were presented and they rejected a civil claim. But Ms Moloney said: "If two people from Cyncoed (an affluent Cardiff suburb) had an argument, would they have arrested a woman from Cyncoed in that manner? "It's no different because I'm an Irish Traveller. I'm still the same as everybody else. I still bleed the same. I still feel the same. We're all human."